When you talk about how many bags a woman should have, the perfect answer is “one is never enough” and I would think talking about how many pouches we all should have, the answer will be the same, as many as we can have or make. I always love to make pouches, they are so fun and easy to make, some can be all sewed by machine and some as this one all made by hand (almost), but they are so perfect and useful. You can make them in no time! and they are always nice to be given to a friend or your mom or to your daughter for their birthday or just because you want them to know how much you love them. This time I made a tutorial to show you how to make a pouch with hexies with the Japanese technique, almost all made by hand, if you don’t want to use your sewing machine for the only step I did, it will be OK if you do it by hand as well. If you want to know what sewing machine I have to do my quilting and patchwork projects, you can check my favorite quilting machine on Amazon here. 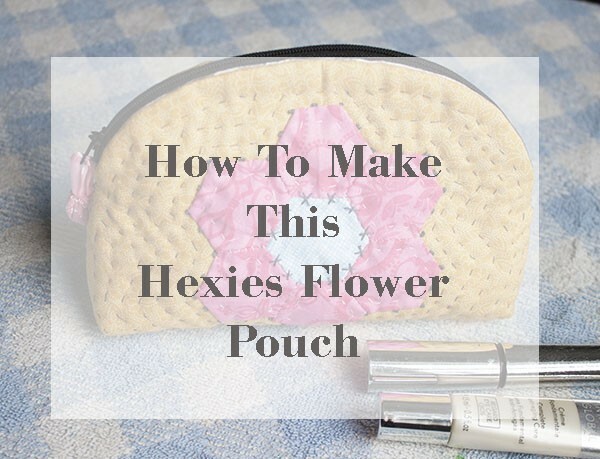 How to make a pouch with hexies. 2 hexies flowers – you can read the tutorial and watch the video. 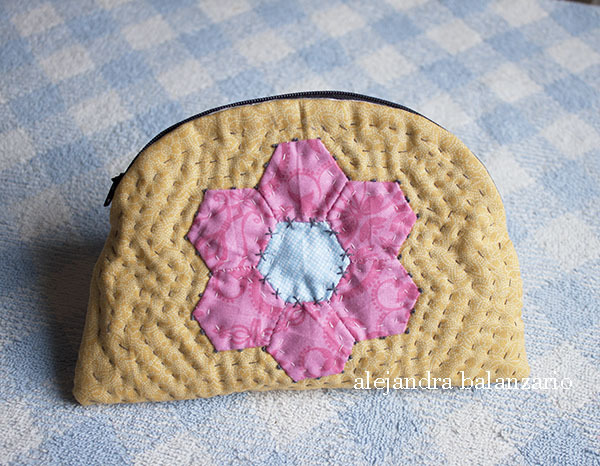 Watch the video to make the pouch with hexies. As I did the video in Spanish (I apologize for not making the video in English) I will write down the steps you need to follow to make this cute pouch. 2. 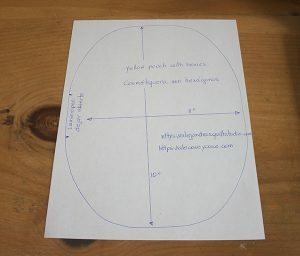 Place the template on the back of the fabric for the inside of the pouch, and mark it down with the help of a pencil (2B) or a marker or pen for fabrics. 3. Prepare the sandwich, place the batting fabric first and over it place the fabric for the pouch right side up, over it place the fabric for the inside, right side down. Hold the three layers with some pins or safety pins. 4. Sew around the pencil line, leaving open 2 inches to turn it out. 5. Trim the three fabrics, leave a seam of 1/4″, and with the help of your scissor for fabric make some little cuts around the curves. 6. Turn the pouch out, push out the edge with the help of your scissors or your fingers. 7. Close the open with ladder stitches. 8. 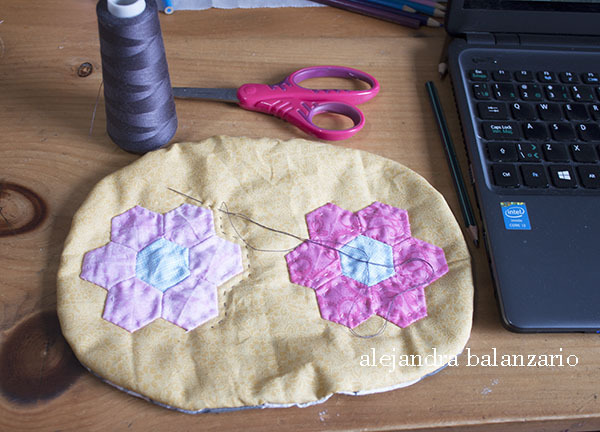 Place on the right side of the pouch the two hexies flowers and hold them on their place with safety pins or with two or three large running stitches. 9. Applique the two hexies flowers on the top. 10. Remove the running stitches from the hexies flowers. 11. Do some decorative stitches, I did just some stitches like “X” on the center of the flowers and some French knots on the edge of each flower. Use dark Grey embroidery floss, two threads. 12. Do some quilting on the mini quilt to make the pouch. 13. Sew the zipper on one side of the pouch, I did this step only by hand. 14. Sew the other side of the zipper to the other side of the pouch, by hand. 15. Sew to close both side of the pouch. On the photo above I show you how the pouch looks like before I worked the next step, you can decide whether to leave it like this if you like the pouch flat, I like how it looks with the both corners flat. 16. Open to square the bottom of the pouch and sew both sides. 17. Turn out the pouch. 18. Add a piece of ribbon (6″) in the zipper, make a yo-yo, put some stuffing in it and pull the thread to close with the two ends of the ribbon inside, make a few stitches to close it. 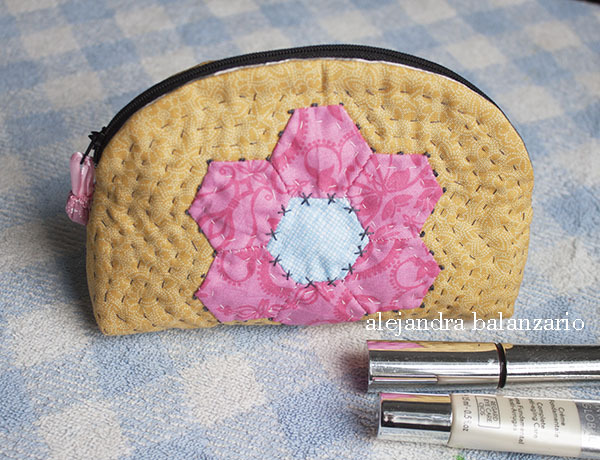 Your new pouch with hexies is finished! It looks nice and cute, isn’t it? I’m happy you made it with me, and I’m sure you’ll be making more than one, with Mother’s day coming soon, making a pouch for your mom will be a perfect idea and present to give away! If you find this pouch cute and you want to make it later, you can Pin it so you can find it later. Thanks for Pin it and share it. If you’re looking for a home quilting machine to make Patchwork or Quilting projects, you can check the options I have for you. 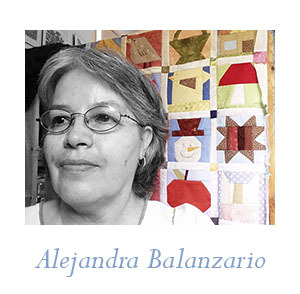 Disclosure: At Alejandra’s Quilt Studio, I like to read about sewing machines and other quilting products that can make my work while I make my quilts easier and better, as I research for these products i like to write the reviews that I think can help you to find the best product that can help you to make your quilts. If you like what we do, you can support me through my chosen links, which earn me a commission.